By Aimee Lee Cheek, Rolando News Staff. 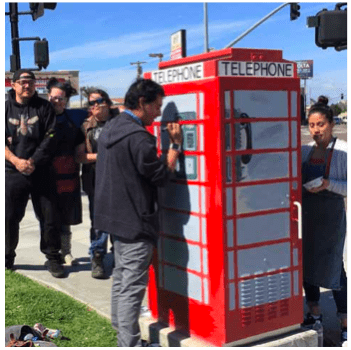 Grossmont College instructor Victoria Rutherford (third from left) and talented students come to the rescue of our “Telephone”, the public art piece that for some years has brightened the southwest corner of College Avenue and El Cajon Boulevard. 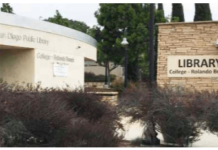 designed and constructed by an earlier Grossmont art class, the work had been scratched and defaced. 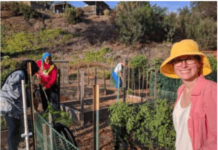 In late March, Ms. Rutherford and her young artists repaired the damage, sanded the surface and gave it a bright new coat of paint. We’d like to ring them up (but hey, this is art, not an actual phone), so let’s just call out– THANK YOU, THANK YOU!